There are more than 100 nationwide and statewide agencies, including the Orange County Consumer Fraud Office, that work with the Federal Trade Commission (FTC) to shut down scams, give consumers a better way to report and recover from identity theft, and expose and stop misleading business practices. 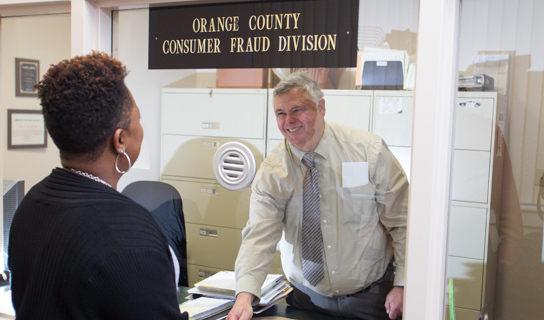 Orange County’s Consumer Fraud Office investigates consumer complaints and works to resolve them through mediation. The Consumer Fraud Unit can also issue citations, refer the complaint to other appropriate agencies and even press criminal charges against the egregious party. If the fraud occurred in Orange County during the past two years, the Consumer Fraud Unit will investigate and determine the best course of action. According to the FTC, the Orlando-Kissimmee-Sanford metropolitan statistical area ranked No. 32 for fraud and No. 22 for identify theft in 2016. Meanwhile, Florida ranked No. 1 for fraud and No. 3 for identify theft consumer complaints in the nation. Morales cited several top complaint categories locally, including real estate, merchandise sales, home improvement, consumer services, advance fees, auto sales, travel service, car rental agencies, non-consent towing and landlord versus tenant mobile home issues. A prime example of a recent case involving consumer fraud locally was a complaint filed by the Bradfordt Park Homeowners Association (HOA) in Orlando, which paid a total of $1,828.54 for the construction of its community bulletin board to a local sign and marketing company. Within the contracted price, there was a $495 fee for “permits and acquisition” that in fact was not done by the company. After filing an online construction complaint with the Consumer Fraud Unit, the HOA was able to secure $495 in restitution. Morales added that the Internet has added more opportunities for fraud. Fancy websites and compelling offers on Craigslist may easily entice people into a trap. The good news is that Morales’ office is here to help local consumers who are victims of fraud. “There are many ways to get conned in today’s day and age, so you have to be vigilant when entering into any type of contract or service agreement with others,” Morales said. While the Consumer Fraud Unit cannot provide specific information regarding the history of a business, its closed files are public records and available for anyone to review. And while consumer information and potential options available for many situations can be offered, the office is prohibited from providing legal advice, representing consumers in legal actions, forcing or ordering a business to provide a specific resolution, and working worthless check cases. The best way to file a complaint is to submit a complaint form along with any supporting documents. Forms are available online on Orange County’s Consumer Protection webpage. Other resources on the website include additional consumer tips for specific types of fraud, consumer tips on natural disasters, Florida Motor Vehicle repair, identity theft, towing information and a privacy fact sheet. The site also features a comprehensive list of local, state and federal websites associated with consumer protection. The Consumer Fraud Unit has the latest information on scams and fraudulent schemes. To help educate the community, unit investigators are willing to come to meetings or events to educate groups on the latest consumer fraud issues. During these free educational sessions, citizens will learn about identify theft, telemarketing fraud, work-at-home schemes, Internet fraud and much more. Know that work-from-home schemes are almost always scams. Avoid “pay today” pressure tactics. Call the hotel to confirm payment if accommodations are included. Ask about the refund policy before you buy. Read a contract before signing, and when in doubt, have someone you trust review it. For more information on the Orange County’s Consumer Fraud Office and how you can protect yourself from fraud, go to the Orange County Government website, call (407) 836-2490 or email fraudhelp@sao9.org.